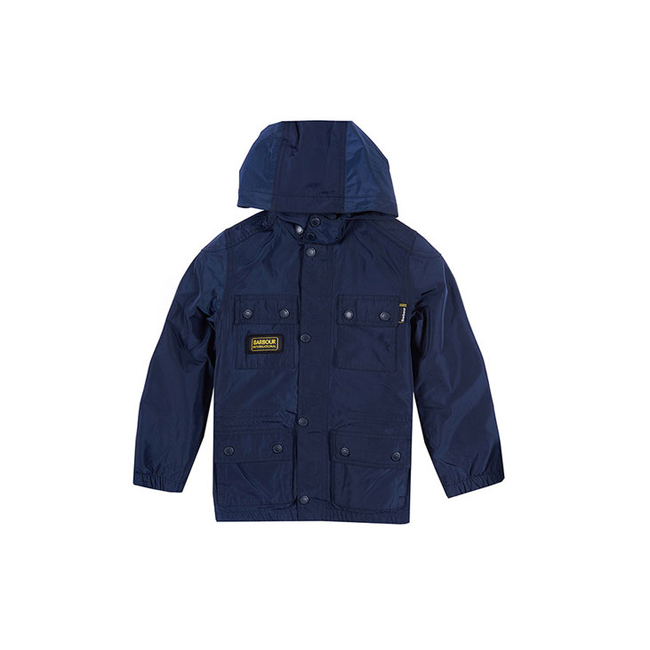 The Nyloc is a boys' waterproof jacket inspired by Barbour International's motorcycle heritage. This stylish jacket is brimming with functional features to make cold, rainy days more bearable. It's made with a technical outer fabric that's reliably waterproof yet comfortably breathable, plus a quilted inner lining that provides superb insulation and a flash of contrast colour. Elasticated hems and a shock cord through the waist ensure a snug, comfortable fit, while the generous hood protects when needed but can also be removed for a smarter look. Four stud-close outer pockets create the iconic Barbour International look and add everyday practicality. I'll get the bad out of the way first; I ordered the Lychee (peach) color and it is more orange than the picture, which gave my husband great joy comparing me to a traffic cone. Big deal. Traffic cones are waterproof. I just got back from Ecuador and this baby was my constant companion. It's a fabulous light fabric. It was not too warm for the coast (indeed, it was light enough that I sometimes used it to keep the sun off of my arms.) and is roomy enough to layer with a fleece in the highlands. We were caught in a few major downpours and it kept me nice and dry! The hood comes out of it's hiding place easily and once you catch on to how the ties work they are super convenient. After the rain, it dries off quickly. When not in use, it easily zips into a compact rectangle that can be hooked to a handbag. (Reply to another review complaining that it gets wrinkled after that: OF COURSE it gets wrinkled!! It's just been stuffed into its own pocket!! But the wrinkles hang out within 5 minutes of being put on again.) The sleeves do run long, which is fine... the Velcro closures will hold them up, or they can be rolled. In sizing, I generally am torn between a small and medium; in this I ordered a medium and it is comfortably roomy with plenty of space for a fleece underneath. In short, I would recommend this jacket for travel or camping or just tooling around in cool or rainy weather. I'd cheerfully buy another (in light blue, maybe. ;-) ).